Cloudberries sparkle in the swamps of Arctic Norway for a few weeks every summer. 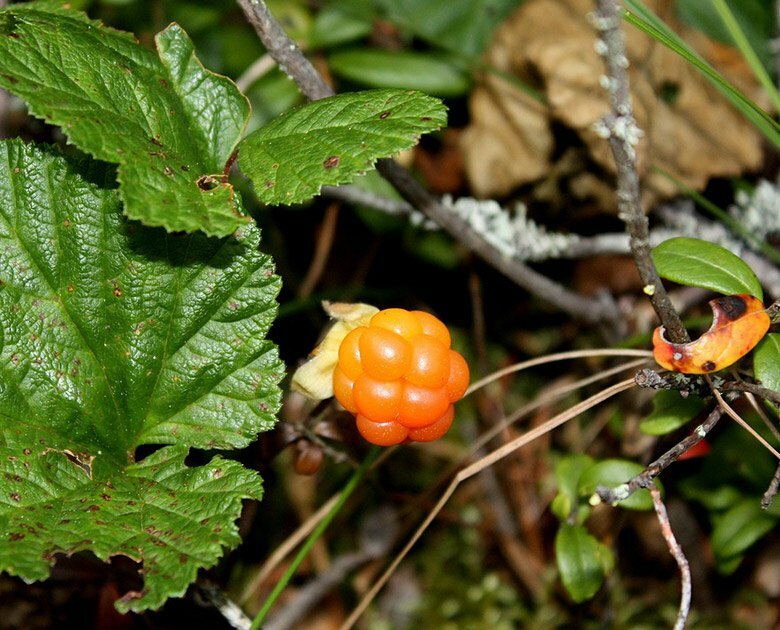 The fruit of the cloudberry plant is an amber-colored fruit that resembles raspberries and blackberries. 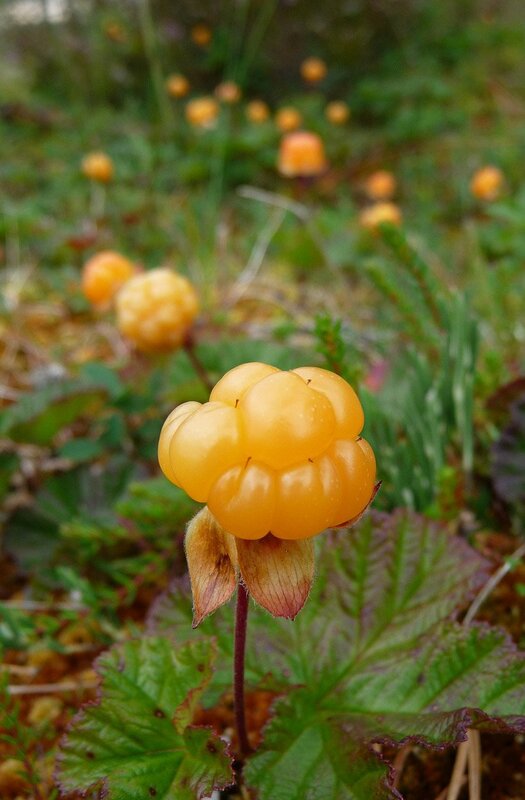 Prized for its scarcity just as much as the flavour it brings to Norwegian desserts, the cloudberry – known as multe in Norwegian – is notoriously hard to find. They thrive in the swamps of the remote Arctic climates of Norway, Sweden and Finland. The ripe fruits are golden, soft and full of juice, with a distinctive sweet-sour taste. Rich in vitamin C, they are often made into jams and even liqueurs. Cloudberry cakes, cloudberry cream, and cloudberry sauce are common products. They can be bought in markets and some supermarkets during the picking season although they can be extremely expensive. Personally, I can recommend the Finnish cloudberry liquor, which goes great on ice or even poured over ice-cream. Attempts to farm the cloudberry have been largely unsuccessful, as they can only grow in a very specific environment. As such, the only way anyone can get their hands on the berry is from hand picking, or buying from someone who has. Picking multer is a popular annual activity for families living near the swamps. If you're interested in going picking yourself, locals may point you in the right direction, but they'll probably keep their secret fields for themselves! The cloudberry plant itself has small green and dark red leaves. The berry begins its life as white and changes into a bright red colour. When it ripens, the berry lightens into a golden hue. There are a few reasons to be wary though. Firstly, you have to be prepared to trek through remote boggy lands and do battle with mosquitos in order to reach your own highland gold! Also, different parts of Norway have specific rules when it comes to foraging for cloudberries. In many parts of the country, you can pick berries anywhere that isn't fenced in. But some places have far stricter guidelines. In Finnmark for example, the land is owned by the state and permission must be sought from local authorities if you want to take berries with you – although you are allowed to pick them to eat immediately! I knew about lingonberries but did not know about cloud berries! Me too Arlene, I just learned about them. I really want to import some to America. Do you know how I would do that? Love cloudberries. Eat it mixed with cottage cheese. And of course on toast. Buy it here at a great little Scandinavian shop in Sarasota. Yummy! They are all over the circumpolar north region. Here in Alaska, they grow wild and the are very expensive! For example,we pay a $100.00 a gallon. They are considered a delicacy and widely sought.